Once in a while I have a recipe that I just keep coming back to and improving and evolving. Lately I’ve been enjoying lots of dinner parties and I’ve been cooking for friends very regularly. 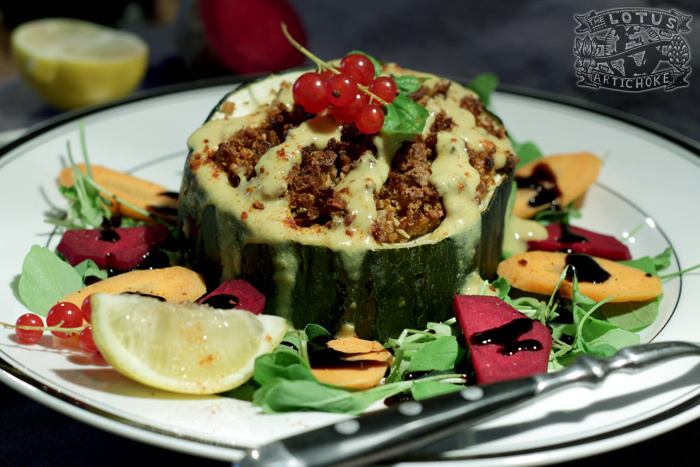 I’ve been cooking a lot of stuffed vegetables and experimenting with different fillings. Just in the last few weeks I’ve cooked either my Tempeh Stuffed Mushrooms, Stuffed Peppers, and Stuffed Squash about a dozen times. (These are all recipes from my vegan cookbook.) It’s just so fun to make a giant batch of tomato rice or spicy quinoa or couscous and mix it up with more spices and other delicious foodstuffs. And then of course to fill up the vegetables and throw them in the oven. A few days ago one of my good friends gave me an enormous zucchini from his home garden. I totally laughed when I saw the 2.5 kilogram monster squash. Everyone at our picnic was quite amused when I passed around the homegrown gift. It took me a few days to figure out how to best honor the gigantic gourd. 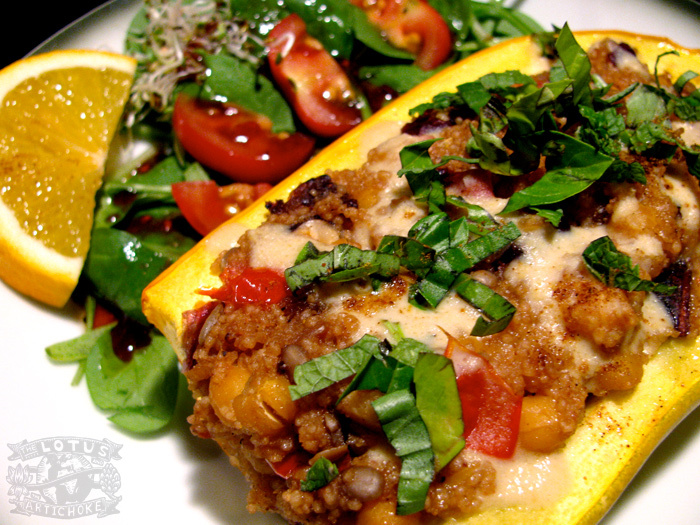 And then it came to me yesterday afternoon: Make a killer variation of my Vegan Moroccan Stuffed Squash!